Description: In the fast growing and technology intensive industry of Voice Over IP (VOIP) an excellent looking website is important. A fresh, techie site is what Valley Solutions delivered to Broadcore.com. 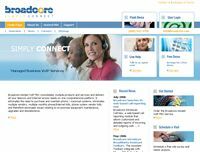 Using a popular design element of random images on the homepage (visit the homepage and refresh the screen) the users that visit Broadcore.com to manage their VOIP counts see a familiar but always changing web page. Description: Dash took advantage of our auto transport web design package and had Valley Solutions, Inc. create exactly the site they were looking for. Dash Auto entered the project with a specific desired look and a specific desired feel to the site all of which was accomplished. Dash Auto loves their new site and remains a customer with Valley Solutions, Inc. We also thankfully announce that they actively refer clients to us with their vocal appreciation of the site we've built. Description: If you are an individual or company who does not believe professional web design is worth the cost Express Auto's website is proof that it is! We are pleased to have learned that the website we created for Express Auto Transport paid for itself in about three months! By converting more visitors into leads and more leads into sales the design of this website has single handily paid for itself. Description: Using our industry specific Auto Transport Website Design Package Teena at All Roads put her company on the map with a website we feel it a top notch site. Using our homepage image refresh design element the site is new every time you visit it. The scenic images invite you to do business with a down to earth company. All Roads reported significant increases in business with their website and especially their custom HTML outgoing quote response email. Description: PottyMD contacted Valley Solutions, Inc. and requested that we create them a web site and E-Commerce solutions that allows them to take their web business "to the next level". Both Valley Solutions, Inc. and PottyMD agree that the mission has been accomplished. A secure Internet shopping cart and store with seamless credit card processing at checkout. Comprehensive reporting including reports on revenue by product and referrer. Description: We have completed a site that we feel "creates an emotional response from the viewer." Which is what we set out to do at the beginning of this web design project. The site was completed in flash, Photo Shop, HTML and ASP. The goal is to present the church in a way that engages new visitors from the first visit to the website. We are currently developing back end applications that will allow church members to use the site to interact with other members as well as keep up to date with church events. Created For: Valley Solutions, Inc. Description: When completed AgentsIndex.com will offer a directory of real estate agents by zip, city and state. Description: Valley Solutions created Quality Relocations website to the clients specifications using PhotoShop, HTML and ASP. Site was created in about three weeks. Description: We created Specialty Mobile System's website in three weeks using PhotoShop, HTML, ASP and Adobe Acrobat. We have created many other sites not shown here. If you are interested in having a website created and would like to see more examples of our work please contact us.